​The Children, Youth and Family program at The Stewpot offers long-term assistance to children at-risk for poverty. Suzanne Erickson has been director for thirteen years. Kids who were in elementary school when she started are now graduating from high school and college. She is particularly proud of this continuity. The ultimate goal is to help kids get the training or education needed for their careers. Everyone who completes the program finishes high school. They can also apply for an annual college scholarship of $2,000 for up to five years. Eighty students will make use of it in the fall. Through the school year, Saturday Kids’ Club provides enrichment programs, breakfast, and lunch once a week. With programming Monday through Friday two months a year, Summer Day Camp is much more extensive. Eighty elementary school kids and forty-five junior and high school youths maintain skill levels in academic recovery programs. Summer Day Camp is for children from families who cannot afford to send their children to a quality daycare or camp. “We want to make sure they have fun and a safe place to be in the summer,” Erickson says. Students learn through fun activities and get lunch and a healthy snack. Many of the teachers and volunteers were once in the program themselves. Twice a month, the Family Stabilization program provides food and clothing to approximately 70 families. Erickson says the Children, Youth and Family program helps parents get food stamps and Medicaid for their children. ESL is offered Saturday nights. 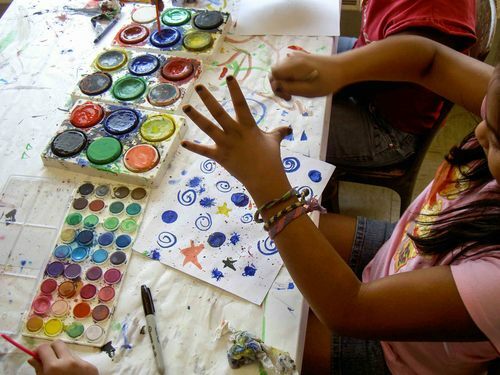 The Summer Day Camp curriculum includes art, dance, drama, nutrition, math, and English. Once a week they go on field trips to the movies, the zoo, a roller rink, or museums. “I went to camp growing up and had no appreciation for how much work goes into it,” Erickson says, with a laugh.